The Commonwealth flag was raised at an event in front of Blackburn Town Hall, on King William Street. The event included both the National Anthem and Commonwealth Anthem, and also Mayor of Blackburn with Darwen Council, Cllr Salim Mulla, read the Commonwealth Affirmation. This event marked the annual Commonwealth Day, which takes place every year on the second Monday in March. Years 3 and 4 Pupils from St Anne’s and year six children from St Michael and St Johns worked with artist Kerris Casey St Pierre prior to the event, holding flag making sessions within school. These flags were then brought by the children on the day. Mayor of Blackburn with Darwen Borough Council Cllr Salim Mulla was joined in raising the Commonwealth Flag, by pupils from both schools who attended the ceremony. ‘Fly a flag for the Commonwealth’ is an imaginative way for local communities to become involved with and associate with the Commonwealth. 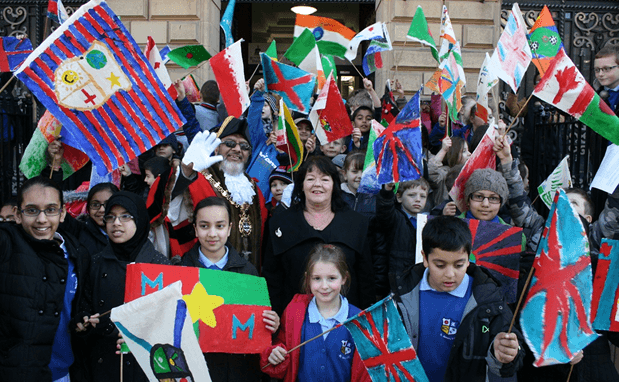 Cllr Salim Mulla, Mayor of Blackburn with Darwen Borough Council said: “This was a chance to join with thousands across the country in raising the Commonwealth flag, marking the values of friendship and tolerance which it stands for. For more information visit Fly a flag for the Commonwealth.